On Saturday I attended the Social Innovation Sydney Barcamp, which was held at CoFA and organized by Kate Carruthers and Michelle Williams. It was a good event, with some great people in attendance to discuss all things social innovation. 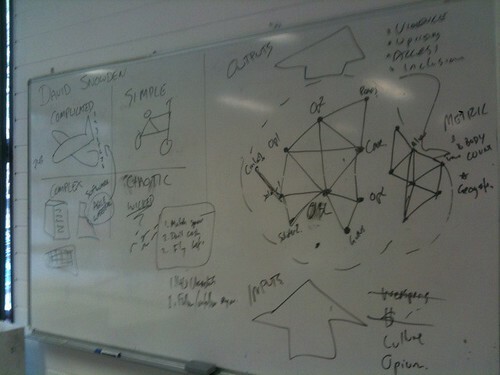 I wanted to post about the theory, because I find it useful to consider a great many other things in relation to complexity theory and emergence. it helps to realize that there are different ways to solve projects and sometime different methods to solve different projects in a very ‘horses for course.’ way. 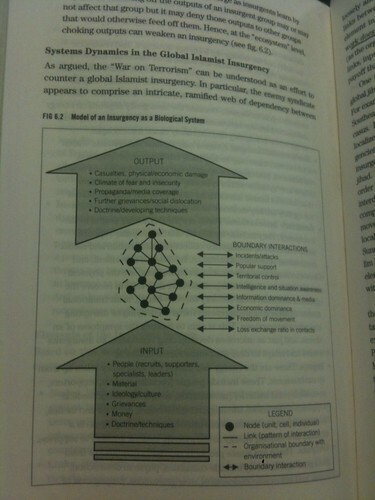 So what is David Snowdens theory, and does does it relate to the ecosystem theory of David Kilcullen? Snowden essentially posits that there are 4 different types of problems; simple, complicated, complex and chaotic. A simple problem is a problem which is quite basic and easily understood by most people. Imagine getting a flat tyre on your bike – that’s a simple problem. You know immediately what the problem is (you have a flat tyre) because you can no longer continue to use the bike in the way it was intended to be used. But, crucially, you can also fix the problem yourself with very little training. It is a classic example of a simple problem. My tyre is flat, so I will fix it. Complicated problems are those kinds of problems which are much harder to understand, but solved with a fairly step by step process and some appropriate training. An example of a complicated problem might be a 747 engine which has broken down. Now, we know when a 747 engine has broken down. It might be smoking or it might be on fire or maybe it just doesn’t turn on. However, the average human being wouldn’t know the first thing about going and fixing a 747 engine. It takes considerable time and effort to understand what is broken in the first place and then further skill and effort to fix it. However, this type of problem, once identified, is very simple to fix. Complicated problems have a very logical and ordered approach to fixing them…like a ten step checklist of things to do to make it work (eg – take part a and insert it in to part b). These problems ar complicated but logical. Complex problems are problems which are hard to solve because they have a multiple variety of outcomes which may need to be catered for. A good example of this is software development. Software development is not something that is inherently easy, yet most of the problems and diffifculties of programing and building working software are in understanding the needs and desires of the end user. What is it that they want to do with this software when it is finally launched? What is it that they will need to do? Whi will the various users be and how will their needs differ according to those differences? These kinds of problems are called complex probelsms, because figureing out how to cater and provide to all of htose different use cases is extremely complex. As a response to that, people use fixed methodologies to solve complex problems. A good example, sticking with the computer software example above, is to use different project management methodologies to take to the task. An example of this might be using Lean or Agile Project management philosophies. These methodologies take in to account the fact that building software is a complex task up front and then include artifacts and techniques to deal with that. This typifys a complex problem – it is something with no apparent solution but one that can be solved with a determined and well used approach, in this case, agile programming. The final problem is a chaotic, or wicked, type of problem. These are the problems that we don’t even know exist yet as they are the ones that just emerge. As such, these have no identified easy methodologies to be applied to solve them. Climate change, poverty, energy consumption and homelessness appear some of the many many different problems which appear to be wicked. The only way to solve these chaotic problems is to start trying to solve them. You can only enter in to a quest to engage and prod the problem, constantly acting against it to test and see what the reponses are and what feedback you get from those actions. Once you get a feel for those problems then you can refine, iterate and the act again to get a better and different set of results. If you’re interested in learning more about The cynefin theory of complexity, its well worth checking out Keith’s presentation on slideshare. How can you use the thoughts of an Austrailan Army Infantry Officer and top advisor to the US in their war on terror to make your organization or project better? This is something ill be speaking about at the upcoming Social Innovation Sydney event, coming up on Saturday the 6th of November. You can register here if you’re interested in coming. I recently finished reading a fantastic book called Counter Insurgency, by David Kilcullen. In the book, Kilcullen discusses how the US and allied forces have been fighting various wars in Afghanistan, Iraq, Iran and Indonesia over the past decade or so. Particularliy, he outlines how the management of troops has changed markedly over that time, in part to manage and maintain better outcomes from the wars they are in. Whilst reading the book, I couldn’t help but see many parallels between what Kilcullen was saying and how projects and project teams operate. I feel like there is a number of Lessons we can take from this. The key with an insurgency is that it is not a war, but a fight for the hearts and minds of the civilians. Kilcullen makes it startlingly clear in the first chapter that the war that we are fighting in Afghanistan is not an old style war. Insurgents use different methods to organize themselves into a network of operatives spread throughout a given area. They don’t tend to use a heirachy model to operate. They spread themselves throughout a target community, and begin inserting themselves; either forcefully or peacefully, into the lives of average citizens. One of their most successful tools is terrorism. It’s important here not get the idea of terrorism confused with a terrorist. An insurgent force only uses terrorism as a tool to further progress their cause. Al Qaeda; and closer to Australia, Jamar Islamir, are examples of insurgent organizations which utilize the brutal force of terrorism for the progression of their objectives. Kilcullen mentions that, often, Western forces have misunderstood this. They have traditionally utilised very brute force attack methods to target insurgent forces, such as air strikes and large bombing campaigns. The problems with this is, many locals (who are not on either side, but simply want to remain safe) will begin to side wih the insurgent forces because they don’t much care for having their houses blown up. Many families that are located in the conflict area often have sons or daughters involved in both sides of the war – with many having one son in the allied forces and one in the insurgent forces, hedging their bets. There are some parallels here between war and social innovation. Most people, if left to their own devices, will choose the option of staying safe. Most large organizations will choose the option of remaining calm and steady. Most small organizations will choose the option of continuing to complain about the big guys and how hey don’t change. Both parties view points can become narrow minded prisons. Any form of project or social initiative must be something that is launched and built with the local community in mind. Marc Andreessen, in a presentation on iTunes U, discussed how when Netscape launched they targeted people who were using FTP to transfer files over the internet in the early days of 1995. This seems to make intuitive sense, but I’m sure that even given that, they approached them in a very specific way. Using Kilcullens thoughts, they wouldn’t have stormed in and announced they were going to destroy all FTP clients. What’s important, is that they probably thought very deeply about the inputs of their idea that would lead to the correct boundary interactions they wanted to observe. In his book, Kilcullen outlines what I think may be the most important idea for organizations and projects which are trying to play the networked game. Today, the most successful organizations and concepts are those that take advantage of the inherent social graph of it’s users. Facebook, YouTube, Google, Twitter and many other organizations have done well at creating worlds where users and customers can spread the organizations values and messages easily. As that network grows, the value of it also grows – just as the first Fax Machine was useless, but incredibly useful once everyone had one. The key here, is that insurgent and complex organizations are soley concerned with one thing: Existing. we may think that the core driving factor behind the devastation that Al Qaeda causes is to reap havock but it’s actually just concerned with existing. Many organizations are similarily focused, and that’s ok. It’s what is natural. Keeping their network alive is what they specialize in. You can do this by monitoring and managing the inputs you introduce to the network. These inputs may be things Ike money, fear, power or weapons for an insurgent operation. inputs such as those just named might lead to boundary interactions between nodes such as violence, drug sales and purchases or power struggles. Managing the types of inputs that are introduced to a network is the best way to manage the boundary interactions that take place. Once you ar aware of these inputs, then you can begin predicting how certain inputs will affect different nodes within the ecosystem you have and which ones you can leverage the most. To me, the future looks like managing these inputs better, to simply connect more nodes which are in close proximity to one an other. The smart organizations have always done it, but now it will become an art form. We’ll see smart organizations moving easily and smoothly from one node to the next, always connecting and transcending their past activities. 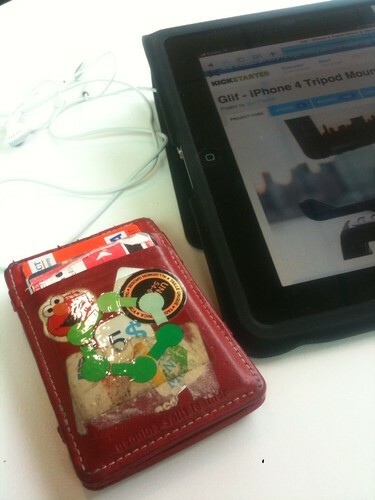 Apple is a great modern day example – they started with the humble iPod, then iTunes, then the iPhone and now the iPad. Rumors are, the next Mac Operating system will be another extension of this and include the suability to buy apps. In the process, they have played a hand in transforming the music, mobile and PC industries around the world. Powerful stuff. All of those iterations are large and ‘big’ but each is always a success because they can build on their previous work to make the next work better still. They can also do it much easier than any competitor could. It’s an amazing competitive advantage. With this ecosystems thinking and some of the thoughts from Kilcullen, it’s an exciting future and one we can look forward to playing in. I was having a recent conversation with Pat Allan about the future of money, and how someone might approach the task of buildig a bank with the benefit of what we know about how money works today. We discussed Matt Mullenwag’s past idea about creating Safe Bank. Eddie Harran ran a Trampoline session on it. Ross Hill also recently commented via his Letter.ly about the future of money, which I responded to with these thoughts. From a user point of view, what banks provide us is actually just a scoreboard. When you break the features a bank provides down into user stories it looks something like this. As a person who earns money, I need a place where I can reference how much money I have at the moment, so I can understand how much or little I have. As a person who has money, I need to be able to use that money at any time, so I can buy things that I need. As a person who has earned money, I need to provide someone with a way to pay me, so I can collect money safely in one place. As a person who owes someone else money, I want to be able to transfer it to them, so I can pay my debts. As a bank, I need to ensure the security of peoples money score, so that they trust us to continue keeping it. Can you think of any others? Could we delete any of the above? Note that you actually don’t need a lot of the abstractions which a ‘bank’ provides on top of this. You don’t *really* need to pay interest (although banks have consistantly setteled on this method to profit from customers). You don’t need to collect interest (although that can be useful). You don’t really need physical branches, unless you don’t trust that the ‘bank’ is able to deliver on the above stories with reliability. In the past, these layers of abstraction were rightfully required to deal with the complexities of distributing physical cash wherever people needed to send or receive it. This problem no longer exists. It’s 2010, and we have the ability to rethink many of the services we’ve taken as utilities for far too long. How would you reinvent the idea of a bank?